Wow, week six already. The season is half over. Time files like an arrow, and fruit flies like a banana. Northern State @ Concordia-St. Paul - Concordia has had a tough schedule so far this season, already playing USF, Mankato and Duluth. Understandably they dropped those games. However, their program has taken a good jump forward this season. Northern seems to have gone the other direction, with their only win coming against Minot. For that reason I'm taking the Golden Bears at home. Upper Iowa @ Minot State - I had a very good chat with a Minot fan last weekend during halftime. We talked about the challenges that have faced Minot in the last couple of years. Coach Aldrich seems to have the program heading in the right direction, but they're probably still a couple seasons out from becoming more competitive. The Peacocks have been competitive in some games, but overall have struggled. Despite UIU's inconsistency and the extremely long trip for them to Minot, I'm going to take the Peacocks in this one. Wayne State @ St. Cloud State - Here's a game that looks a little ho-hum in the hype department, but actually has the potential to be a pretty good game. Both teams seem to be very close to each other ability-wise. I could see either team walking away with this one, but I'm going to go with the upset pick and choose Wayne even though they have a worse record. Minnesota Duluth @ Augustana - Augie recovered from their Key to the City loss in a big way, taking out their frustrations on Crookston. The Vikings have some firepower on offense, and if they're clicking can be tough to stop. This will likely be the best offense the Bulldogs have seen yet this season. If Augie plays like they did against Mankato, then I think we could see an upset. I think Augie has the potential to do so, but I'm not enough of a gambler so I'm going to go with the safe pick of Duluth. Sioux Falls @ Bemidji State - Game of the week, IMO. In looking at the stats, both teams look very similar: run 1st offenses that can put up a lot of points. Fairly stingy defenses. On paper it looks fairly evenly matched. USF has had a slightly more difficult schedule. Bemidji will probably be looking for revenge from the last meeting of these two teams when they decided to go for a win with a 2 point conversion at the end of the game and wound up fumbling to lose. USF seems to be finding its groove. Bemidji will be at home for homecoming. This should be a really good matchup and because I have to pick one I'll go with the Coo simply because: Gabe Watson. U-Mary @ Winona State - Winona is pretty physically banged up, with the loss of key players greatly affecting a team that most considered would be in the thick of the playoff hunt. I'm not saying they're out of it, but so far they just haven't looked like the dominating team that most of us expected them to be this season. Mary is in full-on rebuilding mode. I think this will be a good chance for Winona to get that dominating win that so far has eluded them this season. Minnesota State @ MSU Moorhead - Last week I picked the Dragons for the upset down at UIU. I don't have the guts to pick them in an upset two weeks in a row. Unfortunately for Moorhead I can see this game being pretty one-sided. Minnesota Crookston @ Southwest Minnesota State - I think this game might wind up closer than in years past. Crookston's QB seems to be pretty good, which leads to a poor matchup for the SMSU defense. However, I don't think Crookston has the defense to stop the Mustang's offense. This game might be a bit less one sided than we would expect, but I think SMSU comes away with a victory. Sioux Falls @ Bemidji State - Game of the week, IMO. I agree. This should be the best matchup. Too bad this isn't a night game- I could stop in on my way back from Moorhead to watch. But there are less and less night games in the NSIC. Makes sense in November, but not in September or early October. 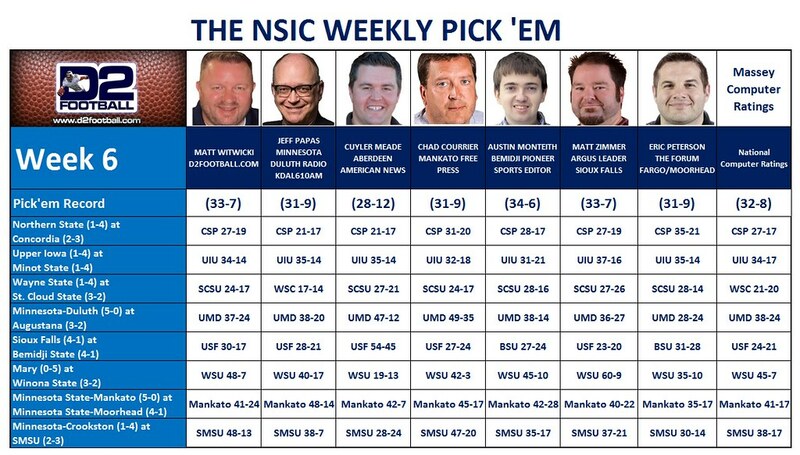 In many ways this is a big test weekend for the NSIC north bullies with Bemidji at home facing a very powerful Sioux Falls team that really found it's stride in the whuppin' it gave Augustana. Duluth last two games against AU were victories by a total of 5 points although those Viking teams were quarterbacked by a man named Heid. Augie entertains the Bulldogs at KO stadium and a victory over UMD is their last chance for post season play, so I would hope for a good game. If the Cougars play like they did against Augie they win in my opinion, if Augustana play like they did against Minnesota State U. they have a shot at victory. Homecoming in Bemidji. The evening is booked with an exhibition men's hockey game at the Sanford Center and activities going on downtown and on campus. Plus, a jump in the lake could be cold in the evening. It all makes sense now. Did they ever have to chop holes in the ice to jump in? MSU used to play all of their home games at night, with the exception of homecoming and the last game of the season. I miss that. Any particular reason why most games are during the day now? Not that I am aware of.... Unless you count the zamboni falling through the ice when the hockey team tried playing on the lake way back in the day. I think that the conference determines a lot of the kickoff times. I also think that the two teams have to agree. Our only night game this year was the Thursday opener. Because it was on a Thursday it had to be at night. For Saturday games I think most would be fairly close driving distances. I asked a junior college coach why they are playing in the afternoon- we usually played at night and had very good crowds. More likely to get high school kids there at night for something to do. He said that way the visiting team could get back home earlier. I usually watch the other posters posts and picks and how they rank with their picks, Clean Liver has some bold, bold, picks this week imo. Minot, Mary, Moorhead and Crookston? I toyed with the idea of Minot, but Liver man, are you ok? I'll sometimes make an upset pick, but for the most part I tend to stay conservative with my picks. Props to Liver for having the cajones to make these. If he hits on all of them, that will pretty much propel him to the top of the pick'em standings as I don't think anyone else will be making those same picks. Our family is making our first visit to Bemidji on Saturday. Any recommendations for places to eat after the game? Dave's Pizza, which opens at 4:00. Could be a wait for a seat, but so worth it! Corner Bar down in Nymore, about two blocks from the Sanford Center. Burgers are really good. Could be busy with a hockey game that night though. Bar 209 downtown is supposed to have very good burgers as well. The couple of times we stopped there, it has been packed and we didn't have time to wait. Tutu Bene downtown is very good as well, Italian and a little slower paced. Fozzie's Smokin' Bar B Que downtown is very good. And I hope you get to see the Beavers jump in the lake! The Green Mill Restaurant which is connected to the Hampton Inn & Suites located on the south end of the lake is always a solid choice, we go there all the time when we visit. As a matter of fact my wife and I will be in Bemidji this weekend also to attend the game. Thanks for the suggestions Millsy and Beaver Hut. Perhaps next year the Beavers can jump in the lake! ........that's about enough out of you.